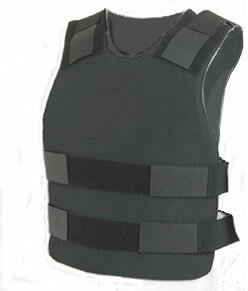 Where can I get a high-fashion kevlar vest? Tracy McGaugh at Feminist Law Professors points us to an excellent article analyzing threatening, violent, and/or murderous behavior by students. The article is co-written by three scholars from different disciplines: Helen Smith, a forensic psychologist, Sandra Thomas, a nursing professor, and Carol Parker, a law professor. The title of the article is “Anger and Violence on Campus: Recommendations for Legal Educators,” but their analysis and recommendations seem to me to apply to all college and university faculty and programs, and perhaps to high school faculty as well. Read it, and consider passing it along to your department Chair or college Dean. The bottom line in this paper is that faculty members are largely on their own when it comes to dealing with crazed students. 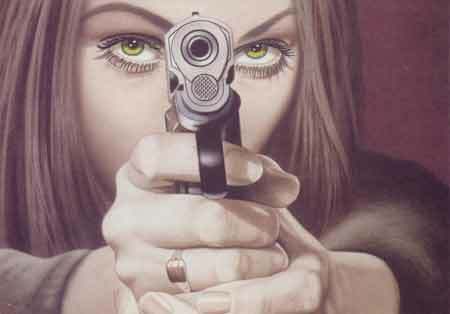 Start packing heat, if that’s your style–and if you live in a concealed-carry permit state, then it’s all nice ‘n legal. (Just be sure to disarm before you go pick up little Emma and Cody at school.) If administrators at your school don’t take advice from Smith and Wesson, Thomas, and Parker, this article will at least arm you with a little more knowledge about identifying disturbed students. Have you had any experience with dangerous and/or armed students? How did you deal with them, and how did your university respond? Do you think that professors in feminist studies might be more vulnerable to threats and violence from students because our perspectives may especially threaten disturbed young men? UPDATE: As Knitting Clio points out in the comments below, sadly there was a fatal shooting with a female perp at Louisiana Technical College in Baton Rouge yesterday morning, which I learned about after publishing this post. However, I don’t think that one female perp is a meaningful trend when every other example of fatal violence at schools (junior high through universities) has featured male shooters, especially given the longue duree of the connection between guns and masculinity in this country. How awful for the faculty and students at Louisiana Tech–yet another school whose sense of safety and fellowship in academic pursuit is shattered. ← Tag, I'm it–Yo la tengo! I must admit that I, too, wonder about this from time to time. I’ve never had a student seem overtly violent, but I have had the withdrawn type who seems resentful of any expectation of attendance, work, etc. I always wonder, when I deal with male students of this ilk, whether there could be some latent violence there. And yes, I too am amazed that this conversation never includes the dimension of gender. I agree, Historiann; it’s clear that the vast majority (almost all) of the shootings and violence are perpetrated by boys and young men, even if some girls are becoming violent. While I do think that there is generally very little discussion of the connection to gender/masculinity in the popular media, this is not necessarily so in the academic discourse. Every time there is a school shooting, its gendered dimensions get discussed by a variety of academics on the Women’s Studies Listserv (WMST-L; http://userpages.umbc.edu/~korenman/wmst/wmst-l_index.html). Sociologist Michael Kimmel, whose work I sometimes find a little too sympathetic of mens’ trials and tribulations, has published a number of articles on this issue and has even had some success in having the mainstream media address the gendered aspects of school shootings. Though it’s not a school shooting, I’ve covered the shootings in Kirkwood, Mo., during the past four days. After watching a local St. Louis television station’s interview of City Attorney John Hessel, I couldn’t help but think how he and other victims of Thursday night’s shooting tragedy might have fared better with the help of concealed firearms.